Full front button down closure with clear buttons. 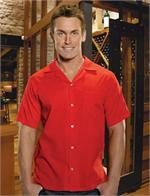 50/50 cotton permanent press and Kodel® polyester. Tailored self collar. Hemmed opening. Left chest pocket. Vented long square cut bottom for in or out wear.